From the first time I heard the song, “A Shogun Named Marcus” in the early 90’s, Clutch has been one of my favorite bands. They have been around for quite a few years and have garnered numerous accolades. This hard rockin’ and hard workin’ outfit from Maryland has produced 10 enthralling full-length releases with the most current being, “From Beale Street To Oblivion.” After all this time and numerous tours both stateside and abroad, I was lucky enough to capture a moment of time with the sardonic, yet nonchalant vocalist for the group, Neil Fallon. The band is completed by guitarist Tim Sult, bassist Dan Maines, drummer Jean-Paul Gaster and organist Mick Schauer. To begin with, I asked Fallon to enlighten me on what it takes to keep the band focused and functional after all this time and what it’s like to write music being such seasoned musicians. Clutch utilizes a lot of humor in their music, which is a fine line for many musicians. I had to know if it was just the way he writes lyrics that has a way of satirizing a topic or what. How about the state of the music industry today? Are record labels being more difficult now than say 10 years ago and are record labels even necessary at this point? 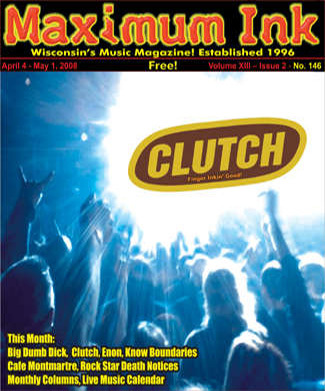 Music and the music scene in general have changed dramatically over the years of Clutch’s reign. How is it different for musicians now than it was say 10 years ago? Speaking of labels, Clutch has been on several record labels over the years. How about some words of wisdom for bands starting out regarding getting “signed” to a label? On the topic of the Internet, how has it affected the band? How about some amazing thing(s) that happened to Clutch while on tour? Be on the lookout for a DVD in the near future and come and commune in some rare and exceptional moments with Clutch when they come to the Majestic Theatre on April 14th.